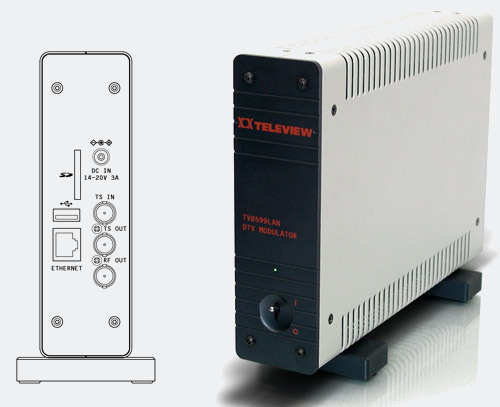 Network modulator supporting DVB-T/DVB-H, ATSC 8VSB, QAM, DVB-S/DVB-S2, T-DMB, ISDB-T, ISDB-S, DTMB, CMMB, ATSC-M/H, DVB-T2, DVB-C2 modulation standards. The unit is housed in an integrated casing which contains a single-chip Embedded Linux and an onboard 10/100/1000Mbps Ethernet port, USB2.0 port and micro SD card slot. The device is controlled remotely over IP using the supplied remote control software. The built in USB and micro SD inputs allow for external transport stream file storage.